Man shoots and kills two New York City police officers. New York City Police Commissioner William J. Bratton (left) is joined by Mayor Bill de Blasio at a news conference at Woodhull Hospital. Update, Dec. 20 at 10:30 p.m.: “They were, quite simply, assassinated—targeted for their uniform,” Police Commissioner William Bratton said at a news conference Saturday night. 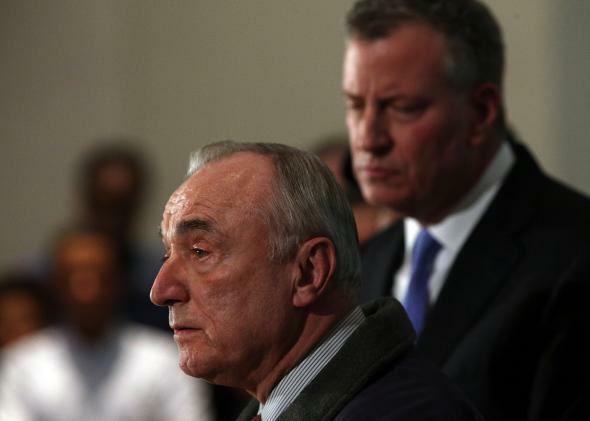 Bratton “looked pale and shaken” as he spoke to the press regarding the killings of Officers Rafael Ramos and Wenjian Liu earlier in the day, reports the Associated Press. The two officers were not targeted for any particular reason except that the gunman had a desire to kill police officers. The two were in the area for an anti-terrorism drill, according to the New York Daily News. “The perp came out of the houses, walked up behind the car and lit them up,” a police official tells the Daily News. “Every New Yorker should feel they were attacked, that our entire city was attacked, by this heinous individual,” said Mayor Bill de Blasio. Despite his show of support, cops turned their back on the mayor as he entered the Brooklyn hospital where the two officers died. It was a striking demonstration of how they remain angry at his support for those who have been protesting against the decision not to indict any police officers in the death of Eric Garner. The move comes shortly after the largest police union circulated a letter in which officers could request the mayor not attend their funerals, notes the New York Times. Rev. Al Sharpton, who has organized many of the protests against police violence in recent weeks, condemned the killings. “Any use of the names of Eric Garner and Michael Brown in connection with any violence or killing of police is reprehensible and against the pursuit of justice in both cases,” he said. I am outraged at the killing of 2 police officers in Brooklyn. That is why we stress non violence as the only way to fight for justice. *Correction, Dec. 20, 2014, 9:03 p.m.: Responding to initial reports, this post originally misstated that Brinsley’s girlfriend in Baltimore had been killed. It was updated upon news that she was expected to survive.